A timely and successful trip to Pennsylvania in September proved the deciding move that gave Gunpowder Farms' Indian Paint the top spot in the 2017 Fantasy Ownership Challenge sponsored by the Maryland Thoroughbred Horsemen's Association, Maryland Jockey Club and Maryland Horse Breeders Association. The Challenge, launched March 18 at Laurel Park as part of a Fantasy Owners Day promotion that included a seminar on Thoroughbred ownership, offered $50,000 in prize money to the "owners" of the top five horses based on their earnings through Dec. 31. The horse's names were drawn randomly by those who participated in the new owner seminar. Indian Paint, a 4-year-old Uncle Mo filly trained by Kelly Rubley, who is based at Fair Hill Training Center, won three races in 2017, all of them in the contest period. She won a maiden special weight event at Laurel in April, an allowance race at Delaware Park in June, and another allowance race at Parx Racing in September, and also had a second and third in allowance company during her campaign. Things fell into place for Indian Paint. She only had to beat one horse at Delaware when the race came off the turf and scratched to two horses, and at Parx, the purse for her allowance race was $70,000 because of an across-the-board purse increase on Pennsylvania Derby Day. Indian Paint, whose contest earnings were $111,745 according to official Equibase statistics, had a chance to pad her lead in the Thirty Eight Go Go Stakes at Laurel Dec. 30, but she didn't get a chance after the final three races of the Saturday card were canceled. The filly, now 5 years old, was re-entered in the $100,000 stakes, which was re-scheduled for Jan. 5 at Laurel. Owner Gunpowder Farms LLC, a Kentucky-based operation that has done very well on the Mid-Atlantic Circuit, overall won 33 races in 2017. Second in the standings was the 4-year-old Include filly Participate with $80,453 in contest earnings. 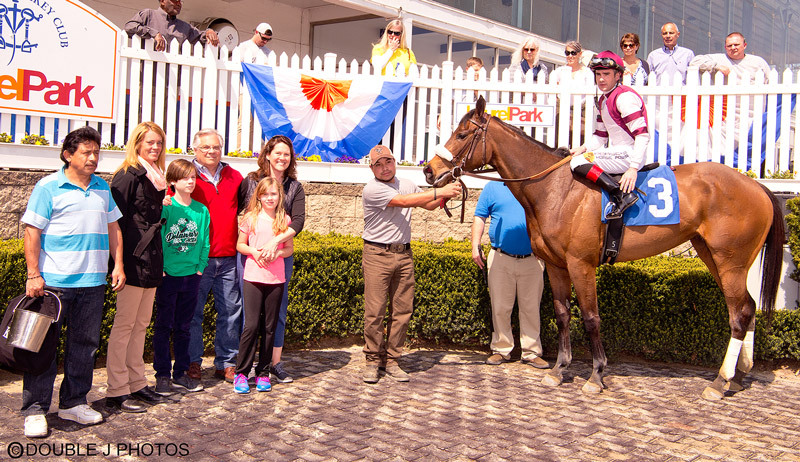 She was claimed by Kingdom Bloodstock and trainer Phil Schoenthal for $7,500 after her final start of 2017 on Nov. 12, but in October won a $60,000 Maryland Million starter stakes for trainer Ann Merryman and Jeff Musgrove, and earlier in the year won two claiming races for trainer Jason Egan. Participate is a Maryland-bred, so she benefited from Maryland-bred bonus money paid on top of the base purse but included in her earnings. As for the rest of the top five, Andrew Sulley's Yes Mz Adah, who won three in a row at Parx in the summer for trainer Patricia Farro, was third with $72,240; LBR Racing Stable's Seeing'n'believing, who racked up three wins, two seconds and four thirds in starter allowance company, mostly for trainer Richard Sillaman, was fourth with $62,350; and Danny Limongelli's Flight Crew, a member of the Hugh and Demelza McMahon Stable, was fifth with $60,293 thanks in large part to an allowance victory at Pimlico in the spring. The complete order of finish is available under the Standings tab. Each of the top five horses had three "owners," and the prize money will be awarded as follows: $30,000 for first, $10,000 for second, $5,500 for third, $3,000 for fourth and $1,500 for fifth. The three owners will split their share equally. First place (Indian Paint)—Cody Favata of Chesapeake Beach, Md. ; Kate Gehret of Lewes, Del. ; and Cara Neary of Alexandria, Va.
Second place (Participate)—Bruce Casella of Voorhees Township, N.J.; Michele Kuegler of Manchester, N.H.; and Rob Thomsen of Baltimore, Md. Third place (Yes Mz Adah)—Denise Heim of Ellicott City, Md. ; James McIntyre of Annapolis, Md. ; and Tom Pendergast of Palmyra, Pa.
Fourth place (Seeing'n'believing)—Guy Botterill of Parkton, Md. ; Kevin O'Keeffe of Baltimore, Md. ; and Fredrik Otter of Rockville, Md. Fifth place (Flight Crew)—Glenn Garelik of Falls Church, Va.; Mindy Miller of Mt. Laurel, N.J.; and Bill Norris of Severna Park, Md. The 15 owners will be contacted soon with information of a special day at Laurel in late January at which checks will be presented and the fantasy owners celebrated in the winner's circle. Gehret, who called Indian Paint her "most favorite horse in the world," said she enjoyed the Fantasy Ownership Challenge and Fantasy Owners Day for several reasons. "This experience has been a wonderful one for me," Gehret said. "I was so impressed with Fantasy Owners Day and felt the Maryland Jockey Club went out of its way to make us feel comfortable and special. The presentations, the luncheon and the paddock experience was fantastic. Being a winner of the competition is icing on the cake, and I am so grateful for the very unexpected and generous prize. This has certainly broadened my interest in the horse racing world." The Challenge was indeed a "surprise," in that it wasn't announced by MJC President Sal Sinatra until the ownership seminar was completed the morning of March 18. All the horses in the contest then competed in six overnight races on the program that afternoon. Roughly 40 horses were part of the contest. Runnin Shoes Stable's Gethot Stayhot won for the fourth time since the Fantasy Ownership Challenge when she captured a $5,000 claiming event at Hollywood Casino at Penn National Race Course the evening of Dec. 20. Gethot Stayhot, a 5-year-old mare by Posse, earned $9,120 for the victory. She now has $40,439 in contest earnings, good for 13th in the standings. Trained by Kimberly Graci, Gethot Stayhot ($7.40 to win as the second choice) rallied from fourth early to win by 4 1/2 lengths over Big Momma. Ridden by Julio Hernandez, the mare covered the six furlongs in 1:12.12 on a track rated fast. Whiskey Sour changed hands and left the Mid-Atlantic region, but the result was still the same as the 5-year-old Maryland-bred gelding found the winner's circle Dec. 16 at Hollywood Gaming at Mahoning Valley Race Course near Youngstown, Ohio. Now trained by Jay Bernardini for owner Michael Annechino, Whiskey Sour was in contention throughout in the $5,000 claiming race and inched past in the late stages to win by three-quarters of a length over Waytoolove. Erik Barbaran rode Whiskey Sour, who paid $14.80 to win and covered six furlongs in 1:14.72 on a track rated fast. Whiskey Sour, who has been hanging around the top 10-15 in the Fantasy Ownership Challenge standings, earned $6,496 and moved to eighth in the standings with $45,737. In his previous start the gelding won at Hollywood Casino at Charles Town Races. Gregory Wood's Whiskey Sour won for the third time since the start of the Fantasy Ownership Challenge with an easy score in a $5,000 claiming race at Hollywood Casino at Charles Town Races the evening of Nov. 2. Trained by Richard Sillaman and ridden by J.D. Acosta, Whiskey Sour took the lead after a half-mile and pulled away to win by 6 1/4 lengths over J W Racer. He paid $4 to win as the heavy favorite and covered the seven furlongs on a track rated fast in 1:27.57. The $5,940 winner's share of the $10,000 purse moved Whiskey Sour from 12th in the contest standings into the top 10 where he sits in 10th-place. The 5-year-old gelding by Scipion is based at Laurel Park. On Nov. 3 at Hollywood Casino at Penn National Race Course, Old Coach Farm's San Cristo easily won a $5,000 claiming event by 3 3/4 lengths at 9-1 for trainer Mike Gorham and jockey Augusto Marin. It was the 8-year-old horse's first tally in the Fantasy Ownership Challenge. San Cristo earned $6,300 from the $10,920 purse to push his contest earnings to $12,940. Participate's third win in the Fantasy Ownership Challenge was the biggest of her career, and it moved her to second in the standings for the earnings contest that began March 18 at Laurel Park. Owned by Jeff Musgrove and trainer Ann Merryman, Participate on Oct. 21 at Laurel captured the $60,000 Maryland Million Starter Handicap for fillies and mares at 1 1/8 miles on the turf by 5 3/4 lengths over Beyond Forever and Shifra Magician, who finished in a dead heat for second. The 4-year-old Maryland-bred filly by Include covered the distance in 1:51.29 on a course rated firm. Participate, who paid $9 to win as the second choice under Jevian Toledo, earned $33,000 for the victory, which took her contest bankroll to $79,633. She trails only Indian Paint, who has earned $105,745 since the contest began in March. Participate, bred by Dale and Joan Everett, had been trained by Jason Egan through July 28 and had maintained a spot in the top five in the Fantasy Ownership Challenge standings since the first day. Merryman claimed her for $11,000 when the filly finished second July 28. When asked after the Maryland Million Starter Stakes why she made the claim, she said: "This race." "She's pretty hyper, and there was a lot of speed (on paper) in this race, so we took off the blinkers," Merryman said of the equipment change. Her son, Michael Merryman, who recently saddled his first horse as a trainer, was in the winner's circle. Two other contest horses competed in the race. Old Coach Farm's Eyerish Inspired picked up fourth and earned $3,000, while Ram Racing Stable's Pardontori'sfrench checked in ninth but still received $1,200. Two horses in the Fantasy Ownership Challenge dominated in victories the weekend of Oct. 14-15 in Pennsylvania and Maryland. In the first race Oct. 15 at Laurel Park, Winning Way Racing Stable's Seeing'n'believing rated just off the early leaders, took over in the lane and drew off to a win by 12 3/4 lengths in an off-the-turf $15,000 claiming race. It was the third score for the 4-year-old Sightseeing filly since the start of the Challenge March 18 at Laurel. Trained by Richard Sillaman and ridden by Sheldon Russell, Seeing'n'believing, who paid $4.60 to win as the second choice in a five-horse field, covered the one-turn-mile in 1:38.15 on a track rated fast. The filly made a significant jump in the Challenge standings thanks to the easy tally. The $13,110 check pushed Seeing'n'believing's contest earnings to $54,070, which moved her from ninth to third in the standings—but not for long. Later on the Laurel Sunday program, Danny Limongelli's Flight Crew finished second in a close finish and earned more than enough to take back third-place in the standings. Participate, now a close seventh in the standings, was entered in the first race but was scratched after the race was taken off the grass. At Parx Racing Oct. 14, Burns Thoroughbred Racing's Banana Anna, trained by Alfredo Velazquez and ridden by Dexter Haddock, romped by 18 1/2 lengths as the even-money favorite ($4 to win) in a $5,000 claiming race at one mile and 70 yards. The 5-year-old New Jersey-bred mare by Kodiak Kowboy covered the distance in 1:43.41 on a track rated fast. Banana Anna earned the $11,400 winner's share of the $19,000 purse to increase her contest earnings to $23,012. It was her first win since the Challenge began.